We have two small group programs available at Cascade UU. The first is our Covenant Group program. This is a program for groups of 6-8 people, who meet regularly to explore topics as well as listen to each other in deep ways. The groups typically have a check-in, reflection, and a sharing of beliefs/thoughts on the offered reflection. These are not groups to offer counseling or advice. Rather they are meant to deepen listening to others as well as develop your own truth and meaning. The second program is our Clearness Circles. These are based on the work of Parker Palmer and the idea each of us have an inner wisdom. The groups meet monthly to listen deeply to each other and help each other to tap into that inner wisdom. The groups are structured in a way where each person gets 15 minutes to explore a question or topic in their life while others listen. Others then ask questions to assist the person to find the answers within themselves. Group sizes range between 3-4 people. If you have a discomfort with holding silence, these groups will help you grow in that area. If you are interested in either of these groups, then please contact Rev. 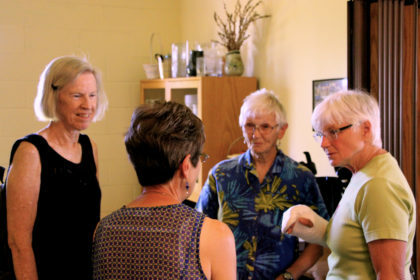 Laura at minister@cascadeuu.org or 509-881-9658 and she can connect you to already formed groups or create a new group for you to participate in.